With a shared loved of barbecue and horses, Marty and Mary built Bad To The Bone BBQ on Oklahoma and rodeo tradition. Marty is a former P.R.C.A. cowboy, and Mary is an avid horse lover and former show jumping horse trainer. Marty’s father, Jerry Wells, was an Oklahoma Quarter Horse Association (OQHA) Hall-of-Famer and legendary horse trainer. Together through Bad To The Bone BBQ, Marty and Mary continue to be passionate supporters of rodeo and equestrian sports. 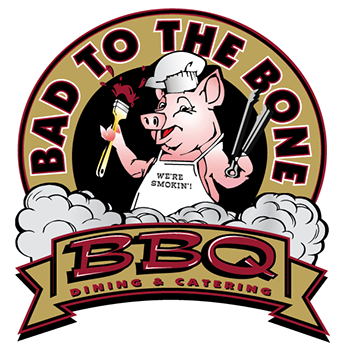 Serving USDA Prime and Choice beef that is naturally aged and hand-cut to strict specifications for maximum tenderness and flavor, Bad To The Bone BBQ hosts fans from far and wide who rave about barbecue that melts in your mouth and is full of flavor. With a casual family atmosphere and rustic ambience, guests do not leave disappointed. Ribs are front and center at Bad To The Bone BBQ, with racks and half racks of beef back ribs, St. Louis pork ribs and baby back pork ribs on the menu. Other popular selections include USDA Prime brisket, Certified Angus beef tri-tip and Carolina pulled pork. Traditional sides include ranch beans, sweet potato fries and mac ‘n cheese, and more; and desserts, including fresh fruit cobbler and chocolate pecan pie. Bad To The Bone BBQ is the first to offer “real pit BBQ” in Orange County, which has led to three expansions and a reputation that spans Southern California and beyond. The popularity of Bad To The Bone BBQ has led to the creation of a budding retail business with signature sauces and dry rubs now available for purchase. These include salsa verde pepper sauce, original pepper sauce and original blend dry rub and the most popular retail offering, original BBQ sauce.